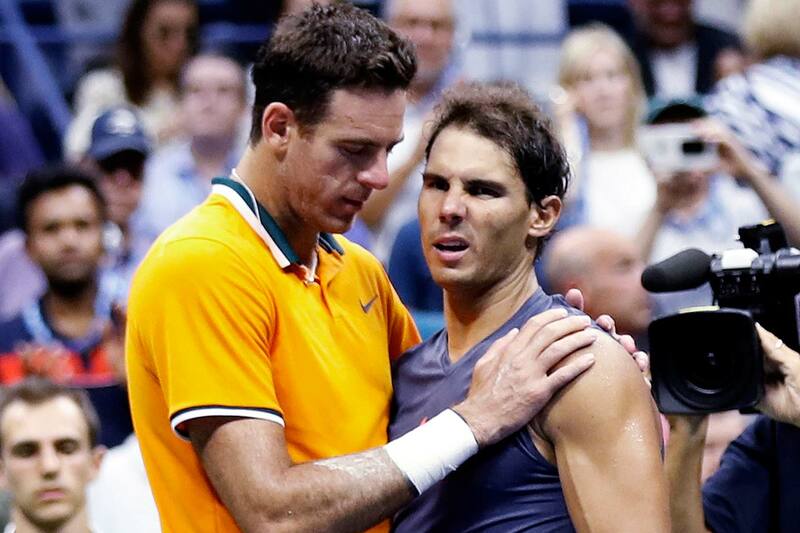 NEW YORK: A weary and wounded world number one Rafael Nadal retired from his U.S. Open semi-final while trailing Juan Martin del Potro 7-6(3) 6-2 on Friday, sending the Argentine back to the Flushing Meadows final for the first time since his 2009 triumph. "I think it was two-all in the first, 15-love, something like this in the first set, that I felt (something)," said Nadal. "I said to my box immediately that I felt something on the knee. "After that, I was just trying to see if in some moment the thing can improve during the match. "But no, was not the day. "I waited as much as I can. You could imagine very difficult for me to say goodbye before the match finish but at some point you have to take a decision." Nadal's stamina and famous fitness have been put to the test on the sweltering Flushing Meadows hardcourts as he has logged nearly 16 hours through five matches. "This year have been a fantastic year until this moment," said Nadal. "I lost four matches. Two of them I had to retire. "Negative thing is two of them have been in quarter-finals and semi-finals of a Grand Slam, close to fight for titles. "That's frustrating. Is tough for me." "I feel that I fight all my career against these kind of things." One of the greatest players of all time, the one chink in the Spaniard's armour has always been his knees with injuries plaguing him throughout his career. Nadal's all out, take-no-prisoners attacking style has seen his body absorb more punishment on the court than perhaps any other player, leaving many to wonder just how long the 32-year-old can continue to pound away. "All my career everybody say that because of my style, I will have a short career," said Nadal. "I am still here." Del Potro, who has also had his career disrupted by injuries, was not happy to get the victory the way he did but the big-hitting Argentine will now get a chance to raise a Grand Slam trophy nine years after his first. The third seed will now await the winner of the second semi-final between Japan's Kei Nishikori and Serbia's Novak Djokovic. It's not the best way to win a match," said Del Potro, who also beat Nadal at the same stage of the 2009 U.S. Open to reach what had been his one and only Grand Slam final. "I love to play against Rafa because he's the biggest fighter in this sport.